It’s not looking good for the major energy suppliers as Which?’s annual energy satisfaction survey reveals the best and worst companies. British Gas, EDF Energy, Eon, Npower, Scottish Power and SSE have a long way to go when it comes to keeping their customers happy. Despite accounting for 98% of the market, none of these big energy suppliers ranked above ninth place overall in Which?’s latest energy company satisfaction survey. Instead, most of the top spots were taken by smaller independent suppliers, such as green company Good Energy – which topped the table with an 85% customer score overall. Npower fared the worst, finishing at the bottom of the table with a customer score of just 39%. See the full results on our energy companies rated page. These results follow the publication of Which?’s energy report, ‘The Imbalance of Power’. The report called for radical changes in the energy market, including a single unit price, to get a fairer deal for consumers. Which? executive director Richard Lloyd, said: ‘Yet again customers have told us they are fed up with the way the biggest energy companies treat them, but the complexity of energy tariffs makes it hard to shop around. We surveyed more than 10,000 members of the public, in our biggest ever energy company satisfaction survey in October and November 2012, and asked them about their experiences with their supplier. We received enough responses to be able to rate 17 energy companies (including two in Northern Ireland). The companies are rated on customer service, value for money, accuracy and clarity of bills, complaints and how they help customers to save energy. The top six energy companies are small, independent suppliers. Top-rated company Good Energy scored five stars in two categories. It was the only company to gain the top rating for helping customers to save energy. It also scored five stars for customer service. Ebico, which is the only supplier to offer a simple tariff in line with what we are calling for in our Affordable Energy Campaign, finished in joint third place with Utility Warehouse. Its tariff has just one unit rate, it has no standing charge and prices are the same regardless of how you pay. Co-operative Energy was included in our survey for the first time this year after being set up in 2010. It finished in sixth place with four stars in all categories. 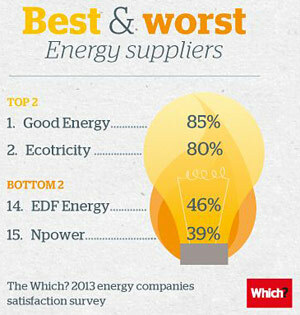 Npower scored just two stars across all categories and finished lowest in the survey. SSE and Eon performed the best of the big companies with an overall customer score of 51%.